Zalmi's Blog: Rest In Peace ? Last Sunday’s burial of the mortal remains of six Holocaust victims was a poignant and utterly unique event in Jewish history. For a people whose laws mandate immediate burial, to wait 75 years is an eternity. The ceremony ended with Kaddish, which everyone was invited to join in saying. And they all did – both religious and secular. And even the non-Jews recited it in transliteration. This event evokes for me the story of Joseph who exacted a solemn promise from his brothers not to be buried in Egypt. His mortal remains had to wait 350 years before being taken by Moses for burial in Shechem in the Land of Canaan – now Israel. The ceremony at Bushey, with its attendance by so many dignitaries and the outstanding eulogy by Chief Rabbi Mirvis, was a great success and tribute to these unknown martyrs of the Shoah. But I do feel that if those souls had been looking down on the ceremony, and the Britain in which it was held, they might have preferred being buried in the Jewish State of Israel. After all that they had suffered up to the point of their murder, the hate speech, the synagogue burnings, the yellow stars, the roundups, the family separations, the cattle wagons, the SS selections and finally the steel clang of the gas chamber door behind them… would they ever entrust the safety of their mortal remains anywhere in Europe, amongst people who had turned a blind eye to their genocide on an industrial scale? Desecrations of Jewish cemeteries in Britain and other European countries are almost a monthly occurrence. The anti-Semites can’t seem to stand us either alive or dead. I fear it is only a question of time before Bushey cemetery becomes another of those statistics and the headstone of these 6 martyrs is targeted. Some would see this as a fatalist view, but the writing is on the wall with the resurgence of Jew hatred we are seeing here and in the rest of Europe and now in America. 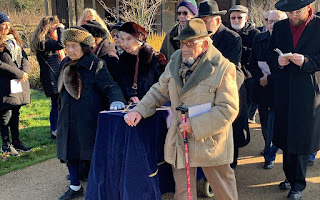 And all within living memory of the Shoah when there were still survivors to carry the coffin last Sunday. My own father, a survivor of Auschwitz and Buchenwald, is buried in a London cemetery. He died when I was sixteen, a victim of heart disease contracted in the concentration camp. When my mother’s time comes, I intend to take his remains for reburial in Israel where a plot awaits him in the hills of Beit Shemesh. There he may truly be at peace. Sadly, this cannot be said for our patriarch Joseph. After waiting 350 years for burial in Israel, the leftists gave Shechem away to the PLO, whose people regularly attack and defile his tomb in the most unspeakable ways. What is the secret of the Jews ?